The thermal properties of the ground are among the most critical parameters in the design of a ground heat exchanger. Moreover, it is very difficult to estimate these parameters with sufficient accuracy. The thermal properties can be estimated using available literature values, but the range of values found in literature for a specific soil type is very wide. Also, the values specific for a certain soil type need to be translated to a value that is representative of the soil profile at the location. The best method is therefore to measure directly the thermal soil properties as well as the properties of the installed heat exchanger. The average ground temperature and temperature - depth profile. Pressure loss of the heat exchanger, at different flows. Soil stratigraphy, dril log and first estimate of the thermal parameters of the soil profile. 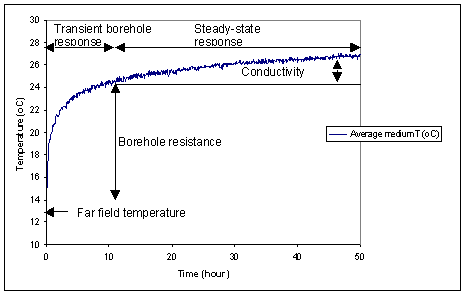 Test results (thermal conductivity, borehole resistance, ground temperature). Quality of the results, stability of the obtained estimate of conductivity (convergence). Evaluation of possible effects of ground water flow. The default "classical" test (based on the line source model) requires a constant energy flux. However, it is possible to generate a second energy step (at a higher flux rate) that can be analyzed using numerical estimation techniques. This makes it possible to determine the borehole resistance with greater accuracy as well as quantify better the effects of ground water flow. Austin, W.A. 1998. Development of an In situ System for Measuring Ground Thermal Properties. MSc. Thesis, Oklahoma State University, USA. 164 pp. Gehlin, S. 1998. Thermal Response Test, In-Situ Measurements of Thermal Properties in Hard Rock. Licentiate Thesis, Luleå University of Technology, Department of Environmental Engineering, Division of Water Resources Engineering. 1998:37. 41 pp. Van Gelder, A.J., Witte, H.J.L., Kalma, S., Snijders, A. and R.G.A. Wennekes 1999. In-situ Messungen der thermische Eigenschaften des Untergrunds durch Wärmeentzug. IN: T. Hitziger (Ed): OPET Seminar "Erdgekoppelte Wärmepumpen zum heizen und Klimatisieren von Gebäuden". 109 pp. Witte, H.J.L., Gelder, A.J, van & Spitler, J.D. 2002. In-situ measurement of ground thermal conductivity: The dutch perspepctive. ASHRAE Transactions, Volume 108, No. 1. Witte, H.J.L. & van Gelder, A.J., 2006. Geothermal response tests using controlled multi-power level heating and cooling pulses (mpl-hcp): quantifying ground water effects on heat transport around a borehole heat exchanger. ECOSTOCK 2006.
heat extraction as well as heat injection experiments are possible. The energy flux into the ground is actively controlled. In Sweden (Gehlin, 1998) and the USA (Austin, 1998) the first geothermal response tests were developed. These in Situ Thermal Response Tests are based on the line source model and make use of electrical resistance heating to inject heat into the ground, measuring the temperature response. As only heating pulses are possible the study of temperature dependent effects such as convection or ground water flow is limited. Moreover, for heating systems, these tests cannot be performed with realistic operating conditions (heat extraction). The IEA classified this test as a type II test. The test rig is housed in a rugged container, contains full telemetry and includes a pressure sensor that serves as a fail-safe. Within the context of the IEA Annex 21 on TRT Groenholland participates as coordinator of the programme "new developments" and is coordinator of the course "Thermal Response Testing".